blade shaft, cnc system, hydraulic plate press system, compressed air and coolant system. The whole structure is frame vertical design. 2.The machine basis, cross beam all use box-type structure through welding after milled procedure to guarantee the joint tightly. After welding, there are annealing stove to reduce the inside stress, good in rigidity and high in precision. 3. Up/down ( Z axis) movement and clamp front/back( Y axis) �s movement are all controlled by CNC system with servo motor drive, and transmission by the ball screw. High in position precision and control precision. 4.Crossbeam (Y axis)�s left-right movement all adopt MITSUBISHI control system, closed-loop servo motor drive. Transmission by helical gear and rack with the character of high speed and high capability in overload. 6. Compressed air will blow away the filings to avoid the hurt to the plate surface and the coolant system will cool the blade and enhance the usage life of the blade. In the same side of the plate-press system, there are several sets of blowing system to enhance the collection of filings. 1. High stability, strong rigidity and also convenient in usage. 2. The CNC control system has several parameter to choose, big in storage and easy in operation. 3.CNC control system has 3 axis, 3 axis is AC servo motor drive, high in control precision. 4. 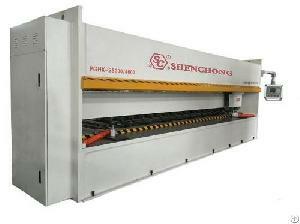 Has 3-10 cutting structure, greatly improve the cutting working efficiency, and also can promote the cutting quality. 5 Use ball-screw and line guide, gear and rack transmission to enhance the machine durability and precision. The repeat positioning accuracy is �0.03MM.